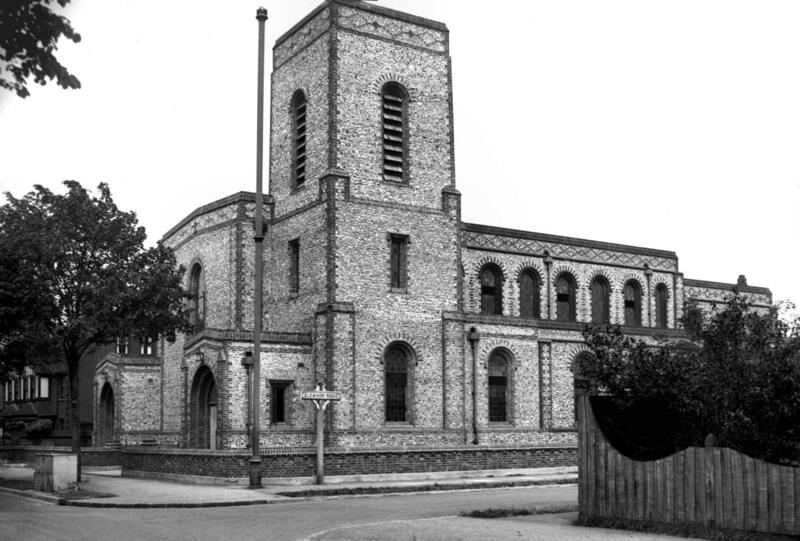 St Alban, in the well-to-do suburb of Lakenham, is the best of the Anglican churches built between the wars in Norwich. The architect was Cecil Upcher, perhaps best known in the city for saving and restoring Pulls Ferry and the Ferry House, where he lived and worked. At first glance, it is a surprise that this elegant building, largely in the Early English style, should date from the 1930s, but the large, blind chancel is more of a clue, and the crisp suburban setting is reminiscent of that of the many south coast churches built in that decade. The grand south porch is in the Norman style, and a fine sculpture of St Alban sits in an alcove looking east from the chancel wall. Below him are set three stones with plaques recording that they were brought here from Canterbury Cathedral, St Alban's Cathedral and Norwich Cathedral for a ceremony to mark the start of work on August 4th, 1932. 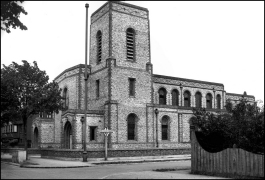 They were dedicated by Bertram Pollock, the Bishop of Norwich, but it would be another five years before he could come back to consecrate the building in 1937, towards the end of his staggering 32 years as incumbent. With the storm clouds of war already gathering, the opening of St Alban must have seemed a triumph of hope. The Norwich photographer George Plunkett came here on the afternoon of the 25th June 1938, the year after the opening, and took the photographs below. You can see at once that the Norman motif from the south porch is repeated in the arcades, creating a near-Classical effect. I came to St Alban on a sunny day towards the end of July 2009, some 71 years later. Unlike other city churches, the urban context here is almost entirely unchanged, the polite Edwardian houses around still the setting that Upcher and Plunkett knew. I stepped through the west porch into an interior which was full of light - there is no coloured glass at all here. Again, and despite the exterior, the sense is of a Classical building, and the arcades a reminder of the influence of that genre on Modernism - blot out the clerestory, and we might easily be in part of Basil Spence's University of Sussex. 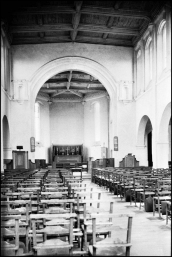 The wooden chairs photographed by Plunkett have all gone, to be replaced rather uneasily by modern cushioned ones, although generally the clearing of clutter does the building a service. Above the clerestory rides a beautiful panelled roof, slightly canted and looking for all the world as if it has come here from an 18th Century country house. St Alban contains an interesting medieval survival. This is the 14th Century font which came from Knettishall, just over the Suffolk border. The parish church of Knettishall, which has always been in the Norwich Diocese, suffered abandonment in the early decades of the 20th century, and in 1933 its furnishings were dispersed, mostly to Riddlesworth church on the Norfolk side of the border, but the font came here. It was a happy coincidence that St Alban happened to be the only church in the diocese under construction at the time. The font cover appears Jacobean - it may well be by Upcher, who was an accomplished font cover designer, but his are usually in the Gothic style. Could it also have come from Knettishall? 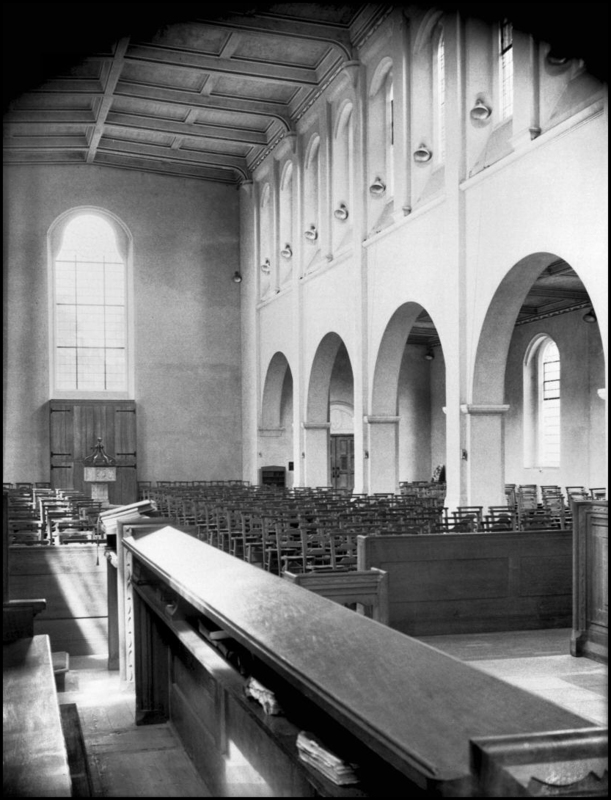 In George Plunkett's photograph, the east wall of the chancel appears rather stark. The Reverend Hawthorn, Vicar here in the 1950s, obviously thought so too, and decided to suggest a competition in the pages of the Eastern Daily Press to provide a reredos. The winner was Christ in Glory by Geoffrey Camp, which depicts the Risen Christ above Norwich scenes. It is perhaps not the church's best feature. Rather better, to the south, the glazed windows of a side chapel are engraved with scenes from the Nativity. When I came here, the parish mid-week Eucharist was in progress, another reminder that the High Church end of the Church of England in Norwich is still hale and hearty. When it was over, the Priest and the congregation could not have been more friendly and welcoming - this must be a lovely church to go to.